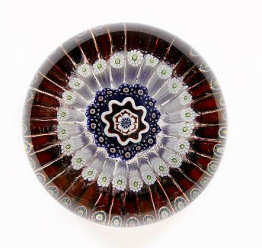 Paperweights are the perfect example of a functional object raised to the level of fine art. Pictured left: The Clichy Basket of Flowers sold at auction in 1990 for $258,000. Image Copyrright: Sothebys. 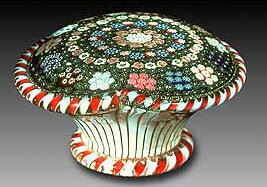 Paperweights can be solid colours, or hollow on the inside, but most have a pattern or an object – such as a flower or a goldfish – on the inside. Chinese); slightly concave, smooth, and shiny (better quality production, such as Perthshire in Scotland). 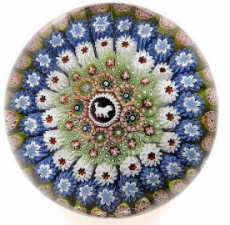 Pictured right: A St. Louis concentric millefiori paperweight dated 1848.The central dog silhouette within five concentric rows of millefiori, the outer row including the signature cane SL 1848 and minute ‘dancing devils’ silhouette canes, all within a row of tubular canes, 7.8cm diam by 5.4cm high Image Copyright: Bonhams. Also, many have a signature or date etched on the bottom, or somewhere on the piece. With over 2,000 paperweight manufacturers to consider, the collector is wise to specialize.